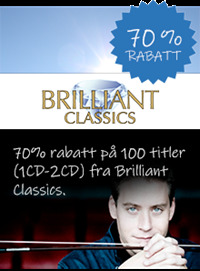 Nå tilbyr vi 70% rabatt på 100 titler (1CD-2CD) fra Brilliant Classics. 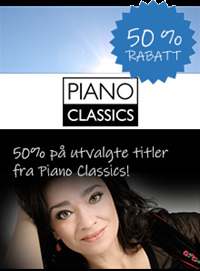 Blant annet Mozarts fiolinkonserter, Erik Saties pianomusikk, Bach orkester- og cellosuiter, kammermusikk fa Hindemith og mye annet. 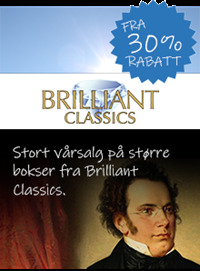 Stort prisavslag (40%) på samlebokser fra Brilliant Classics (3CD-6CD) med både velkjente og mindre kjente komponister fra musikkhistorien. Stort vårsalg på større bokser fra Brilliant Classics! 50% på utvalgte titler fra Piano Classics! 12 april slippes Oehms spektakulære storsatsning, « Vespertine. : A Pop Album as an Opera», Bjørks album fra 2001 i operaform. 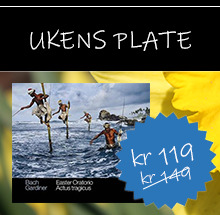 Med anledningen av denne releasen presenterer Oehm en operakampanje (-40%) under april og mai, med mange av sine beste operainnspilinger. 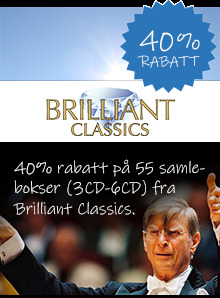 Stor operakunst av mestre som Wagner, Strauss, Mozart, Verdi og mange flere. 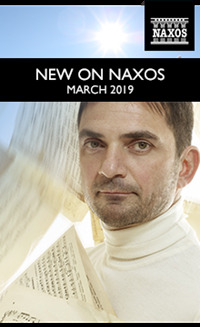 Here is the March issue of NEW ON NAXOS. 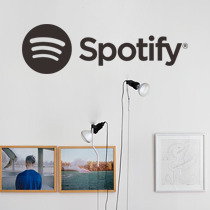 This month’s spotlight recording is the final volume of Claudio Monteverdi’s Complete Madrigals – the Ninth Book, and Scherzi Musicali – performed by Delitiæ Musicæ and Marco Longhini. 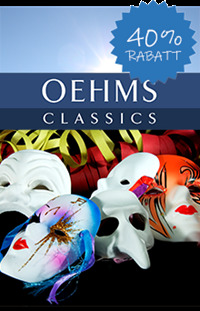 The first volume released in 2002, the series has been highly acclaimed by many critics and publications, with ClassicsToday.com declaring these recordings ‘the versions of choice’. • Johann Sebastian Bach’s St Matthew Passion, recorded by the Bachchor and Bachorchester Mainz conducted by Ralf Otto. 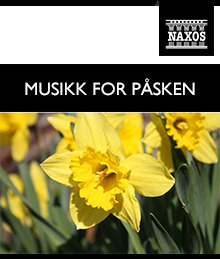 A follow up to the acclaimed recordings of St John Passion and Christmas Oratorio, this new release again features tenor Georg Poplutz, soprano Julia Kleiter and baritone Matthias Winckhler. 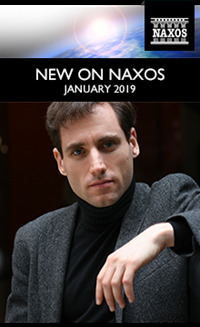 Here is the January issue of NEW ON NAXOS. 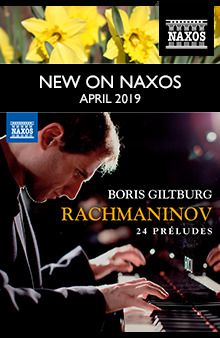 This month’s spotlight recording is Boris Giltburg’s newest recording, performing Franz Liszt's highly virtuosic Transcendental Etudes, with the Rigoletto Paraphrase and La leggierezza. 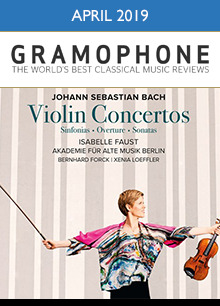 Boris’ previous recordings have been highly acclaimed, with his album of Rachmaninov’s Piano Concerto No. 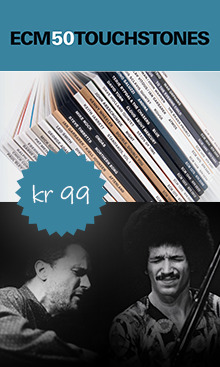 2 most recently winning the Best Solo Performance (20th Century) at the inaugural Opus Klassik Awards. 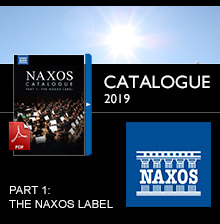 • A collection of works for cello and orchestra by Russian composers Piotr Il’yich Tchaikovsky, Nikolay Rimsky-Korsakov and Alexander Glazunov, featuring the acclaimed cellist Li-Wei Qin, accompanied by the Czech Chamber Philharmonic Orchestra Pardubice and conductor Michael Halász.